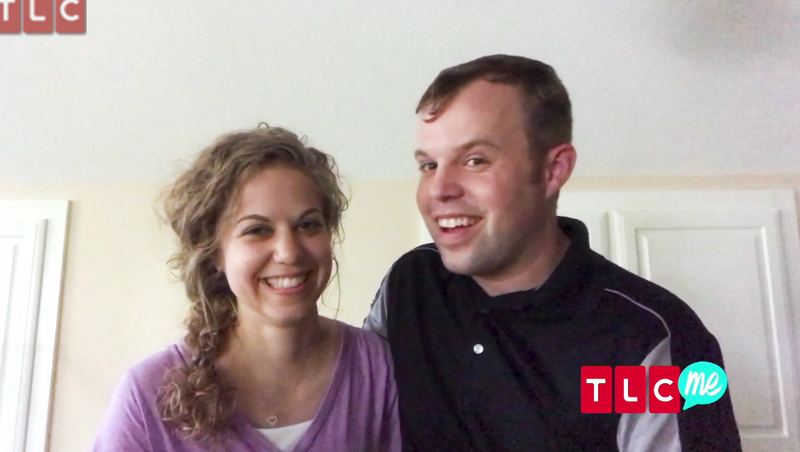 Duggar Family Blog: Duggar Updates | Duggar Pictures | Jim Bob and Michelle | Counting On | 19 Kids: John is Engaged! Jim Bob and Michelle Duggar will soon have four married sons and four married daughters! Just one month after announcing their courtship, John-David Duggar and Abbie Burnett have more big news to share. They're engaged! John popped the question at an airplane hanger. He told PEOPLE Magazine that he and Abbie have "been ready for this step for a little while, but it was really just I had a lot of things I wanted to get done to make it really special." So happy to hear the good news of another Duggar getting married, kids are a wonderful gift and now there will be more. I know. You could tell from the picture of her in the plane that they'd become engaged and were just waiting for Jinger's baby to arrive before making the announcement. You are probably right Anon 9:36 AM!!!! Wow a courtship of 4 weeks? I’m thinking they were courting a while before they announced it. And maybe they’ve been engaged a little while too before this announcement? I wonder how much longer he had been wanting to propose to Abbie since they have only been courting 4 weeks??? These relationships seem to happen at an alarming pace as if it's a race to be married. 3:50, the post does NOT say they've been courting 4 weeks. It said they announced it 4 weeks ago. I was 35 years old when I met my husband. Was alone all those years. Knew what I wanted but had not found him yet. I knew after the first date we were meant to be. We were engaged within a few months and married a few months after that. Have been together for a long time. When you know, you know. May be hard to know for sure if you are in your teens and still figuring yourself out but if you put in the hard work to understand yourself, you should know by your mid-twenties what kind of person you want to marry. Dating many people is only for those who don't know themselves, in my opinion. Called it!! Jinger's baby arrived, John David's engagement announced. A Fall wedding will follow. Good news. JD looks so happy. Can we get more information about Her? We don't know anything. Is she a real nurse and keeps the job now? She is a LPN. Yes it's a "real" nurse although I don't quite understand the "real" nurse comment. It's been stated she's a LPN which is a "real nurse" by anyone's standards. Stop trolling. An RN is a real nurse. So is an LPN. RN doesn’t stand for real nurse by the way. Abbie had a different education path than RNs and can’t do certain things that RNs do but she’s still real. An LPN is definitely a “real nurse”. I am curious about her formal education and whether or not she’ll keep her job. It’s not important and I’m not judging her choice either way but I think it would be interesting for one of the Duggars take a slightly different path and show their audience there are many ways to pursue your God given gifts. An RN is a Registered nurse. An LPN is a Practical nurse. An LPN has less education than a registered nurse but practices nursing according to the state board of nursing in the state where they practice just the same as an RN. There are some things that an LPN is not allowed to do but most of their work is exactly the same as an RN. They both care for patients to achieve the same results. Nice news, there is so much negative news in all forms of media, it’s great hear something good. They look very happy! Excited for this couple. Congrats to the newly engage couple. May God keep you two under his spirit. I'm thankful that I didn't marry my first crush after only knowing them for a few weeks. Still John David and Abbie, being in their late 20's, at least have had some time to mature, which gives me hope that they are truly a good match for a lifetime together. "Knowing of" someone and "knowing" someone are vastly different. The couple was clear they have only come to know each other extremely recently. They have known each other for a couple of years according to JD. They only became involved in a courtship a couple of months ago. I think the relationship is on a solid foundation. They have known each other for 3 months, if they wed in 3 months as is usual for Duggars engagements, they will have had a 6 month romance, even shorter than Josiah and Lauren. However I doubt either will be marrying a first crush at 28 and 26. And they're obviously ecstatic to be with each other. So that makes me less concerned with the swiftness of the relationship. Me too. I courted a guy in my early 20's for maybe a year. Everyone said he was God's will. He turned out to be Mr. Wrong. I met my husband at age 25 and we married 4 months later. But this time I knew he was the right guy. It said they "knew each other" for several years, but I think that's stretching it. They may have known OF each other for years but the interest only peaked recently. You can know OF people but not be particularly close to them. john-david & abbie have actually known each other for years, similar to josiah & lauren,but apparently when they got to know each other better recently, they decided each other was what they wanted in a spouse. and being a bit older, they've probably 'noticed' enough other potential suitors to know when the one is the right one! i used to tell my kids not to be surprised if they ended up with one of their siblings friends as a spouse, but they laughed. isnt it funny how that happens when you've known someone for a while and then "bang"! i now have 2 grandchildren because of this!! I would not call it a crush. A crush, in my opinion, is someone who doesn't know what they want and is dazzled by someone. If you know what you are looking for, then you are not dazzled by someone, you are attracted to them for life. I don't know John-David but he comes across as a guy who is hard-working and introspective. I am a pilot and a pilot must be extremely meticulous and pay attention to details and be a perfectionist. I think he has been waiting for someone with some seriousness and education. Whether she continues to work or not, having gone through training and been in the work world gives a new level of seriousness and maturity. Abbie seems like a perfect match and I wish them all the best. I'm so happy for the two of them. I can see why John was attracted to Abbie. She has a contagious smile. I wish the very best for them in their journey together. why such a huge rush to get engaged then married? Doesn't make sense to me. I once heard that it was good to be engaged through a whole year of seasons and it makes sense to me. Congratulations John David!! She looks like a very sweet Christian girl!! I’m so happy for you both!! I’ve never seen you so happy!!! That seems quick, though I suspect their relationship started well before it was made public. At least I hope it did. It seems like it would be a heavy burden to be so scrutinized by the public at the very beginning of a new relationship. Even just seeing still photos of the 2 of them, John David appears to be transformed. I had no idea he could smile so big, and you can practically feel his happiness radiate through the photos of the 2 of them. Abbie looks radiantly happy, too, I just don’t have a sense of her from before for comparison. I wish the 2 of them every happiness in their life together. I just find it disappointing that he had the proposal's theme all about aviation. That is HIS hobby and interest, not hers. It would have been nice if the proposal had reflected her and had shown that he had put thought into what would be special to HER. They have been dating for a few months, and we know that in that short time JD has flown Abbie several times. So it is likely they view aviation as part of *their* relationship, since it has probably comprised - what - 1/3 of their dates? Give him a break - he's too excited to think straight. I'm surprised that quiet and staid JD even had a romantic side. If that's what he could come up with, then so be it. And it falls right in line with their male leadership idea. My first thoughts were yes, we know you like planes, John David. But what does Abbie like? Or is she supposed to like planes now because you do? First love can get a bit goofy, can't it. Wow. Sorry ladies but it is NOT all about you. I absolutely despise women who think the engagement and wedding is only for them. No, it is just as important for the man. How wonderful that John David shared his love of aviation with Abbie. Perhaps she has come to enjoy flying as much as he has. My husband shared his love of skiing with me and had an amazing engagement in the snow. Who didn't see that announcement coming? You could tell from the last picture that they were already engaged. when i turned on my computer, this fantastic news was actually one of the headlines so i turned to this page immediately! i've got goosebumps! i am so happy john-david found the love of his life and isn't waiting on starting their life together. abbie is a very lucky woman. remember, good things come to those who wait! Not too surprised to hear this. John David seems absolutely ga-ga over this woman. It's truly a whirlwind courtship. I would normally worry about that, but these two are older and the Duggars always seem to marry well. Wishing them both a lot of happiness. I am so excited for John David and Abbie. I have never seen him so happy. Abbie is gorgeous and I love her smile. Lol..I have never seen John David smile so much either. I am truly excited for them and cannot wait to see their wedding. It is more special to me than thw others for some reason. Good news. John David acts like a different person now that he's with Abbie. A Fall wedding would be nice. I think John David will love living out of state for a change. A breath of fresh air. Congratulations to them both!! I wouldn’t hold my breath waiting for John David to move to Oklahoma. I’m sure she’ll move to Arkansas. I doubt John will be moving. It'll be Abbie moving to Arkansas I'm sure! You're right! JD's work has always been loose and flexible, while Abbie has a job. Congrats to them! Go John David! I think I'm more excited to hear about John-David's engagement than the other Duggars because they are older, educated, probably have other interests than just getting married and having babies. Congratulations!! Congratulations yd Abbie and John David. God Bless. well at least he is ready and not a teenager getting married? next will be the twins in a courtship. Wedding in about october? So happy for you both and especially you John David. How wonderful! Congratulations to you both. Marriage and love are such wonderful things to enjoy in your life. When you find the right person to be with, it makes everything seem better.